Online since 2000, LinuxInsider is part of the ECT News Network family of tech and e-business sites. It covers Linux and other free, libre or open source software for an audience of developers, sysadmins and IT managers. 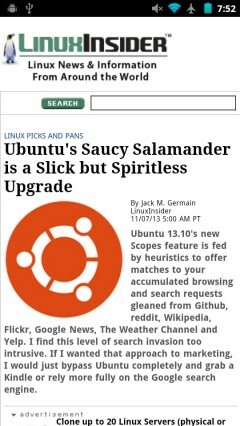 Earlier this year, LinuxInsider and the rest of the ECT family were fitted with a shape shifting responsive redesign. At desktop resolutions the site’s homepage design looks basically the same as it has for the last several years. But when the viewport is less than 480px wide , the sidebar, banner ads and item descriptions all vanish and the page morphs into a single column smartphone friendly Webapp. 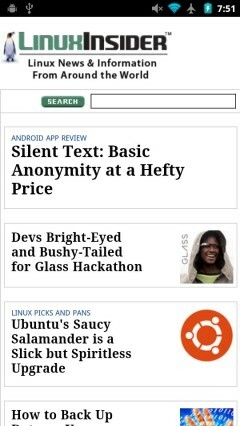 This entry was posted in Tech News Sites and tagged Linux, mobile site review by Dennis Bournique. Bookmark the permalink. Iam a student..so my budget is low..
thats where root of my whole problems.. I tried US because its lowcost there..dont know anything about china. If i had friends i can buy it via them.. but no friends..
have few one in relation..but disturbing them for buying is bad behavior..
because i didnt faced them much before.. So they will think that i reached them because i want help . So they will give me a selfish image in their mind..
so i stoped dreaming about buying.. I want to buy cheap dvbt dongles from us. but how i can do it from india.. I dont kmow anyone in us..
Have you checked eBay for US sellers that will ship to India? Why US? It would be cheaper to source your dongles from China.